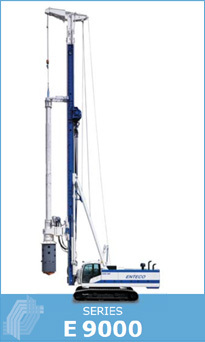 Complete range of foundation rigs, comprising 5 basic models with overall weights varying from 60 to 220 tons. Within this range of equipment for medium and large projects the Contractors will find the machine that best suits their requirements. The machine is set up for two pull-down system: cylinder or winch, to be chosen according to the drilling system requirements. The extremely rigid structure of the rotary head has been calculated and tested to withstand the stress of the various types of drilling methods. E9000 system (frame, Mast Support System, sliding mast) ensures best performance and stability. Each model can be equipped with rear outriggers to increase the pressure on the tool. Particularly innovative machines featuring a frame and an exlusive mast support system designed by Enteco. The system makes the mast extremely stable and rigid and yet transportation is simple. - Low front attachmente point and high back-stays attachmente point. This geometry assures an extreme rigidity ot the mast support system. - The absence of two rear cylinder ensures greater stability. - Mast vertical translation along two slides. - The foot of the mast can rest direct on the ground. - Transportation operations are simple by reclining the mast on the machine.